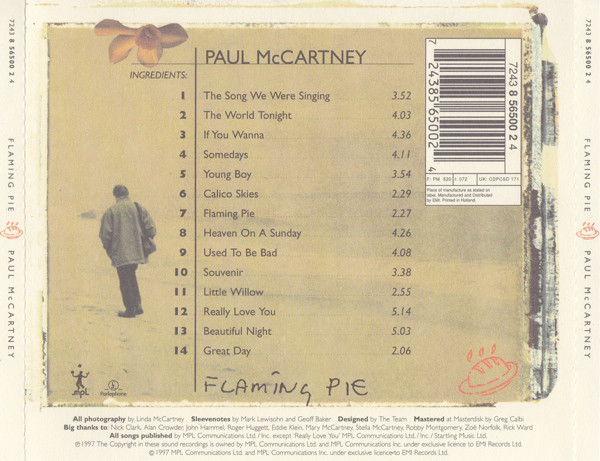 For this album, Paul McCartney wished to return to a "back to basics", less grandly-produced and tuneful approach, with simple, direct songs, often with an acoustic backing. The songs were intended to be catchy, immediate in their appeal and unassuming. By and large he achieved his goal with this highly listenable, pleasant album. "The Song We Were Singing" is an appealing song with gentle acoustic-backed verses and a big, thumping chorus. "The World Tonight" is a classic piece of solid McCartney, easy on the ear rock, with his bass superbly melodic. "If You Wanna" is another nicely chugging, mid-pace, warm rocker. There is some excellent guitar backing on this one and a crystal clear acoustic backing riff. A song like this sounds like mid-sixties Beatles updated, as they would sound if they were still putting out material. This would be typical of McCartney's contributions. I really like this one. "Somedays" is a lovely, acoustic/vocal reflective, almost pastoral number. The guitar work, strings and woodwind near the end is very fetching. Only McCartney can write this sort of thing. Yes, he often strays into over-sentimentality, but this is not one of those occasions. "Young Boy" is another of those gently rocking numbers that no-one could possibly take offence to. It is catchy, engaging and enjoyable. "Calico Skies" is wistfully sublime, one of his most appealing folky-style acoustic songs. 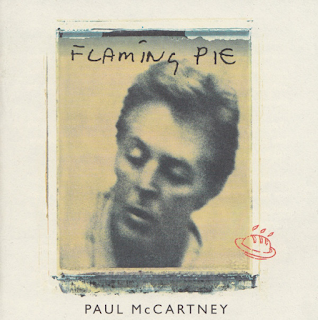 "Flaming Pie" is very Wings-esque, for me, with some "Lady Madonna"-ish piano. "Heaven On A Sunday" is another gentle, laid-back acoustic and rhythmic number that again does not get over-sentimental, but is a sensitive song. If this had appeared on a Beatles album, it would have been hailed as a work of genius. Some sumptuous electric guitar soloing on it too, played by the legendary Steve Miller. Miller appears next up on the bluesy rocker "Used To Be Bad". A lot of people don't seem to like this track, reading around here and there, but I love it. It has some stonking guitar, a great bass underpinning it and great vocals. It is one of my favourites on the album. "Souvenir" is another bluesy, guitar-driven rocker with a soulful edge to the vocal. "Little Willow" is another tender, softly-delivered quiet number. "Really Love You" sees the temperature rise again with a cooking hot bass-driven bluesy number, featuring a great McCartney vocal and a huge throbbing bass line. "Beautiful Night" is a classic mid-pace McCartney song, full of captivating atmosphere and hooks. Great stuff. "Great Day" is a quirky closer to the album, but it is slightly blighted by an enormous thumping drum beat that is not actually necessary, something McCartney seems to like using occasionally, usually to the detriment of the song. 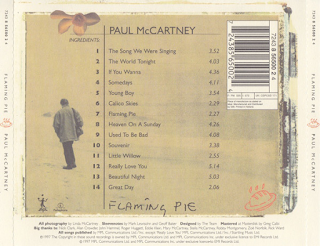 A lot of Paul McCartney's albums suffer from being thought of as "just another Paul McCartney album". I know what is meant by that. This is not one of those albums, though, it is better than that.